After a long rehabilitation, Stefan was paired with Service Dog Knoxville, a Canine Companions® assistance dog whose duty is to help Stefan live more independently. Like all Canine Companions assistance dogs, we provided Knoxville free of charge to Stefan, and the power of their match is incredible. Last week, while celebrating Independence Day, we took time to recognize the freedom and opportunities we have as individuals and as a country. But for our graduates, it means even more. With 3.8 million veterans injured in combat and 1 in 5 Americans living with a disability, the work of an expertly-trained assistance dog takes on special significance on Independence Day. The work our assistance dogs do, and the 40 commands they learn, help them perform jobs like picking up dropped items, turning on lights, opening doors and so much more. 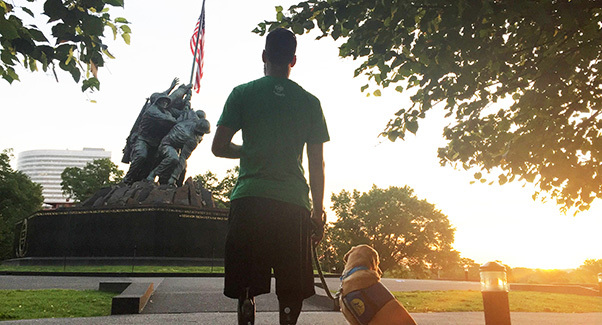 At Canine Companions, EVERY day is independence day. Learn how you can share in our mission and give a dog a job. Now through August 8, Build-A-Bear Workshop will donate $1, up to $50,000, from the sale of each Promise Pets™ furry friend purchased in their stores. Thanks to the Build-A-Bear Foundation, children will continue to receive life-changing assistance dogs at no charge. We’re excited to introduce the B litter, born on June 7. NBC4-Columbus will follow the journey over the next year and a half of one B litter pup as they work towards the goal of becoming an assistance dog to a person with a disability. Watch them here! 2017 was another record-breaking year. We are proud to have increased placements by 58% in the last five years, while maintaining the quality of our programs and a graduate success rate of 97.5%. Read our 2017 report and learn how we're working to maintain our success. Order Mutt Lynch Winery's Canine Companions® puppy label wine and 25% will be donated back to us! Get a sneak peek into the adventures of puppy raising. Follow @ccicaninepuppy on Instagram. DogFest season is upon us! Find an event near you. Raise a puppy. Change a life. Become a volunteer puppy raiser. There are so many ways to get involved! Learn more.